Fiber reinforced composite materials encompass a wide range of material classes from reinforced glasses, plastics, and rubbers through to more recently developed metals and ceramics. 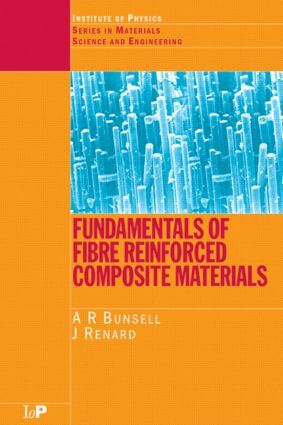 Fundamentals of Fibre Reinforced Composite Materials is a comprehensive and authoritative book that introduces the topic with a brief history of composite development, a review of composite applications, the types of fibre used, and their respective indiviual properties. An entire chapter considers organic matrices and their behavior, reviewing all of the most commonly encountered polymer matrix systems. Composite manufacturing techniques are then discussed, including those methods employed in the production of advanced metal and ceramic matrix composites. The remaining chapters are devoted primarily to theoretical treatments of composite behavior, with emphasis on the understanding of damage mechanisms such as cracking, delamination, and fibre breakage. Where a mathematical approach is required, an attempt is made to relate the sometimes rather abstract notions back at the structure of the material being discussed. With extensive sets of sample problems accompanying each chapter, Fundamentals of Fibre Reinforced Composite Materials is ideally suited to undergraduate and graduate students of materials science, structural, mechanical, and aeronautical engineering, polymer science, metallurgy, physics and chemistry. It will also be of use as a reference to researchers working with composite materials and material scientists in general.